Twitter, LinkedIn, Facebook, oh my! Social media has become an essential marketing channel for both B2C and B2B companies as part of their marketing strategy. However, only 1 in 3 marketers are able to measure the return on investment of their social activities. That's terrible! In order to continue being effective on social media, marketers like you (and me!) need insight into what’s driving clicks and engagement on social media -- and more importantly, how that data compares to historical efforts. With that information, you can easily make continuous improvements to your strategy. However, surfacing that information could mean spending hours pulling and comparing historical reports. Not anymore for HubSpot customers like you! We're excited to introduce Social Reports, a new addition to our social media marketing app, Social Inbox. Reports breaks down your social media strategy with analytics on your published messages and their impact on your bottom-line business goals, all on one page in your HubSpot software. In this post, I’ll walk through Social Reports and how you can use each report to improve your social media marketing. Ready? Go! While you’ll land immediately on the Compare Time Frames report, Social Reports includes five different reports altogether. These include Compare Platforms, Compare Channels, Campaign and Reach along with Compare Time Frames. Let’s go through each of them separately and how you can use them. Let's discuss each sub-section and what it does. You can see this data come to life in the first chart under this section. The final copy on this section breaks down your interactions on your published messages for that given time frame. Please note: If you want details on a certain message you published, the best place to go for that is your Published messages dashboard. That way, you can start with the message and see the data, which is the opposite of how Reports work. 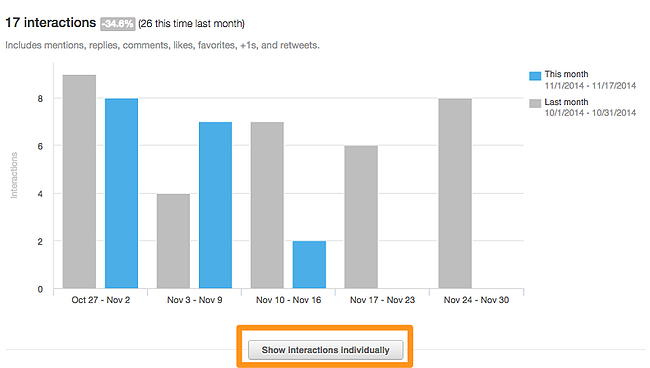 When looking at any chart in Social Reports, you can click into those messages, which will bring you to your Published messages dashboard. As you change around the time frames to compare your progress, consider not only your historical data but the benchmarking data as well. The historical data will tell you where you’ve improved in your strategy or where to put put more effort. The benchmark data can give you tips on what to change or what to continue doing in your social strategy so you can keep getting the kinds of engagement and interactions folks with your same size audience reach are getting. This report is great for showing you at a high-level if your social media strategy is getting you the kind of engagement you want. You can also see whether the platforms and channels you are using are working for you, so if necessary you can stop spending your valuable time creating content for a channel that doesn't work. "Analyzing the Compare Time Frames report showed me that we do not have a clearly defined social media strategy. 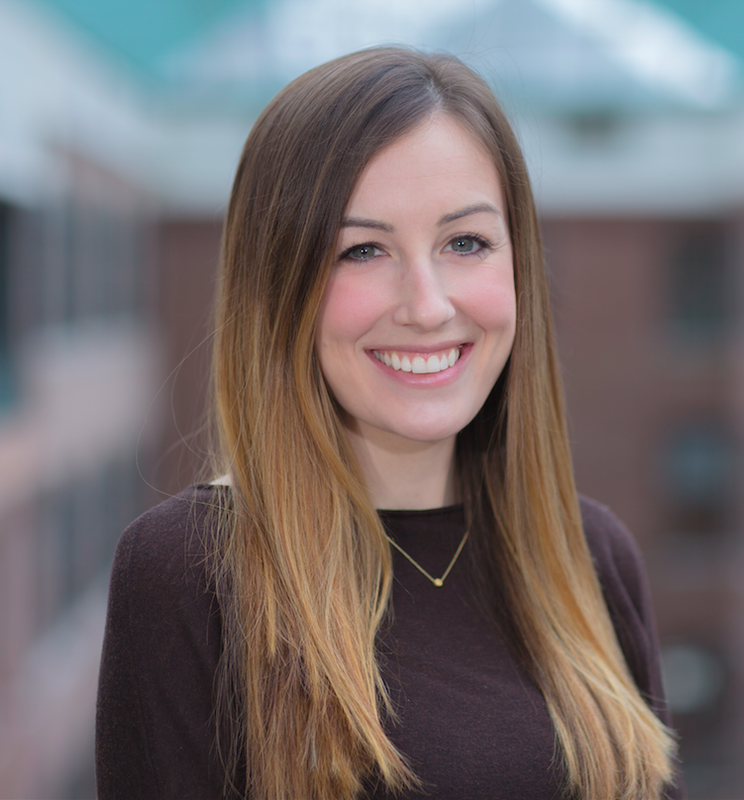 Social Reports highlighted that for me in a manner that was easily shareable with management." 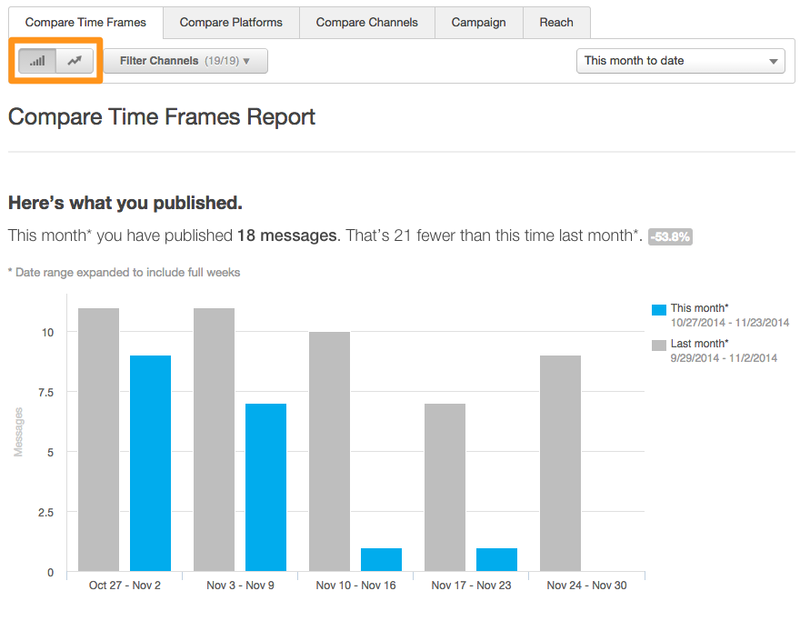 See your own Compare Time Frames Report in Social Reports now! This second report gives you the same level of detail as Compare Time Frames, but the focus is on comparing the social platforms you’re using against one another. As a reminder, a platform is a specific social network -- like Facebook or Linkedin. To check it out, navigate to this report in the on-page navigation in the tabs. First, you’ll notice that you can change the time frame of the data by toggling the time frame drop-down menu in the upper right. By default, the report is broken down by the platforms you publish to, seen by the legend on the right. 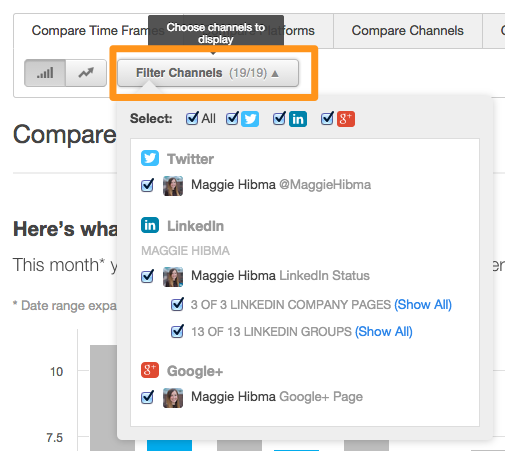 You can always choose to filter out platforms in the “Filter Channels” menu above the chart. This report is great for discovering which platforms are performing the best for you in terms of individual message data. You can also look at which platforms are best impacting your bottom-line business goals, like visits from social media to your website. "Social Reports has had a big impact on my daily social media activity because I can quickly compare how I am doing this month so far compared to last month. This makes it easy to adjust my strategy if I see that I am behind in one or more areas for the month." 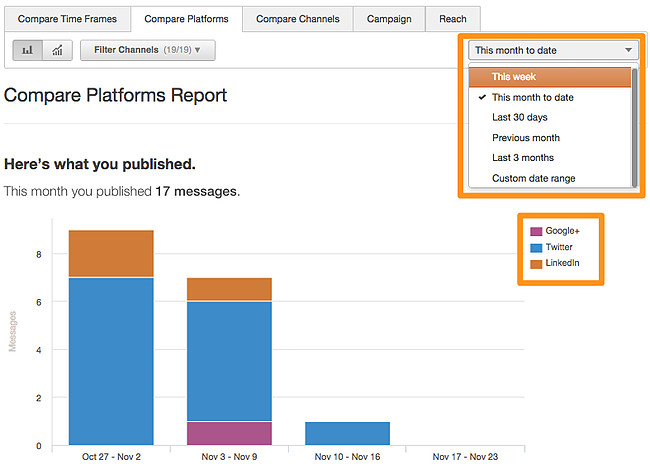 See your own Compare Platforms Report in Social Reports now! This third report digs one level deeper than the Compare Platforms report, allowing you to see how each channel on each platform performs individually. Channels, in the case of this report, means the specific assets you can publish to on each platform. For example, if you were the admin of two LinkedIn Company Pages, those are considered two distinct channels. The legend on the right shows you which channels are included in the report, which you can change anytime with the “Filter Channels” menu above the chart. From here, the report provides the same information as the Compare Platforms report, just displayed with a focus on the channels you publish to as opposed to overall platforms. This report is great for reporting on how individual channels are contributing to the overall success of your social media efforts. You can really dig deep into individual Twitter accounts or LinkedIn groups -- where all the good stuff is happening. "This is the exact report I have my Marketing Coordinator run for me. Numbers like interactions per message or clicks per message are exactly what I want to know. In the end, I use the data to determine if more Tweets or Facebook posts increase total interaction and interaction per message. That's an important metric for me." 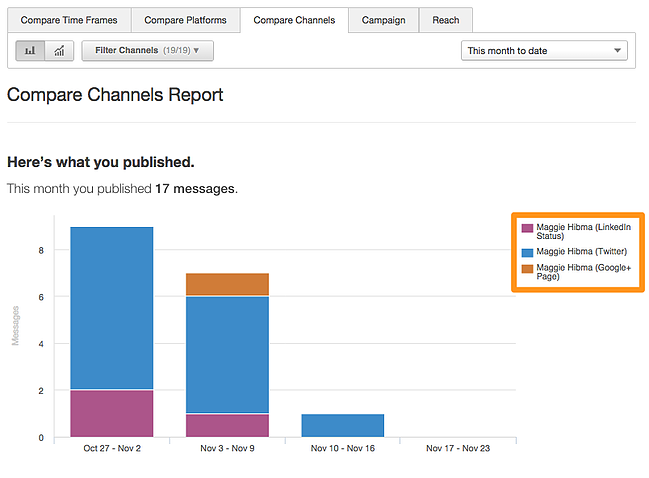 See your own Compare Channels Report in Social Reports now! From here, the report provides most of the same information as the Compare Channels report, minus the “Here’s the impact on your business” section. This report is great for digging into individual campaigns and seeing which platforms are providing you with the most interactions or clicks. 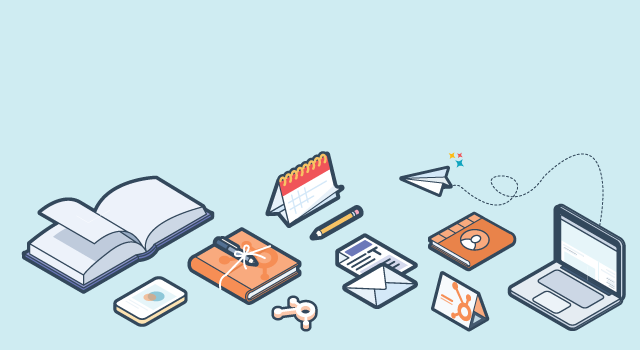 Now, when you create more inbound marketing campaigns, you’ll know which platforms to always include in your campaign plans. One thing to keep in mind is that if you have an ongoing campaign, you can switch the time frame for the data displayed in it’s usual place in the upper right. You can also decide which channels to include in the report using the “Filter Channels” menu. If you have several campaigns with social messages included, check them out individually. How do they differ from one another? Did one campaign’s social messages do better than another? Why? 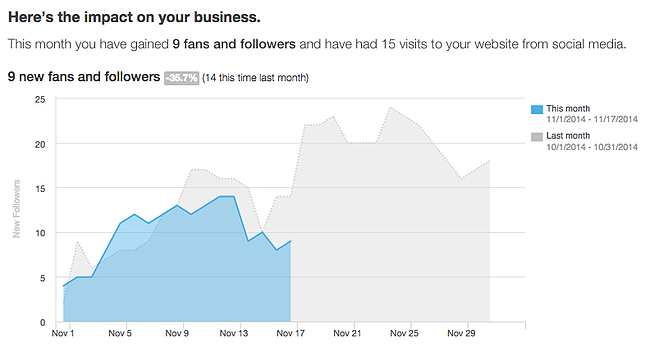 "I'm so happy you've added these analytics! The way you've summarized the findings in plain text is probably the best part. I was using HootSuite and this is a better way to consume the information." 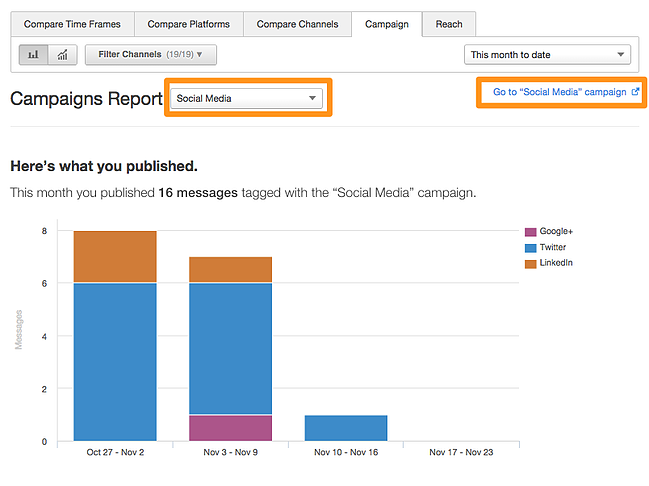 See your own Campaign Report in Social Reports now! By default, all of the available platforms in Social Inbox are included in the Reach report. 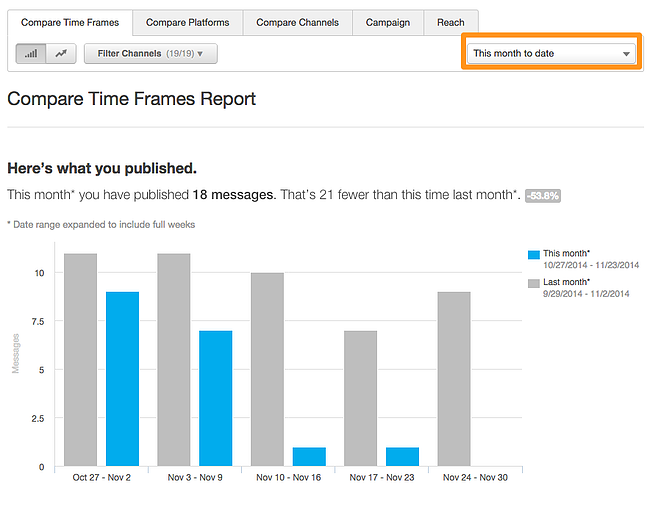 You can still export your Reach data or change the time frame of the data displayed on the chart. 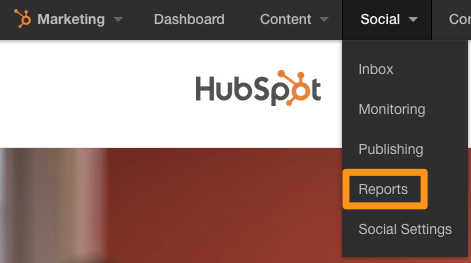 You cannot change the time frame of the information displayed from the Sources Report -- it will only show this month to date -- but you can always dig deeper by visiting the actual report under "Reports" in the main HubSpot navigation. This report is great for easy sharing with others, and gives you a top-level snapshot of how big your reach is across social media while giving you the important bottom-line business metrics you need, like the visits, contacts, and customers generated by social media each month. "I basically wanted one view that can answer, "How is our social media working for us this month?" I don't want lots of detail. I want to know if our follower base is growing (and by how much) and whether people are engaging with the stuff we post. That's it. Simple. And this report does that for me." 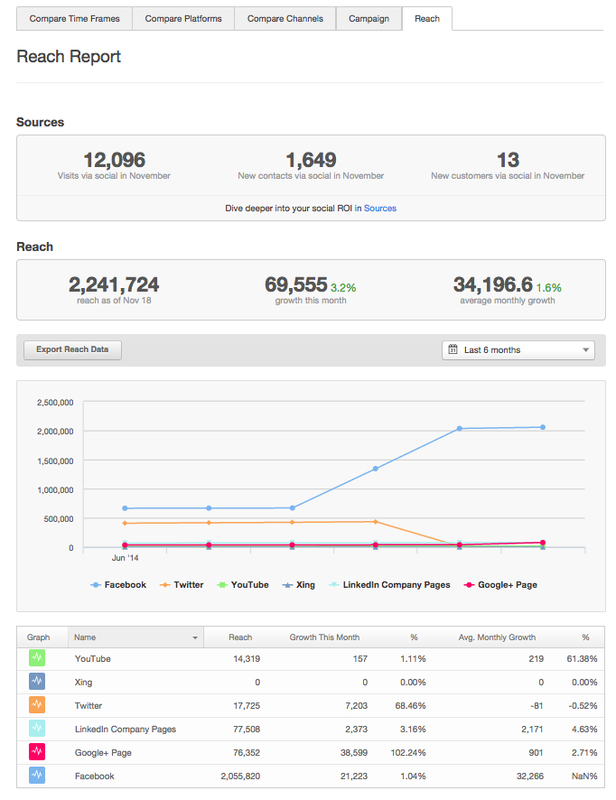 See your own Reach Report in Social Reports now! What do you think of the new Social Reports? What information will you look for? Let us know in the comments!